The Asian consortium planning to rescue Swedish automaker Saab Automobile from insolvency is led by a mainland Chinese alternative energy tycoon whose company has close ties with China's State Grid electricity utility. Being linked to the acquisition of Saab's car making assets could help bring the huge, state-owned utility a step closer toward its long-sought goal of breaking into the electric vehicle market. "It's logical if they want to move into that market," said Yale Zhang, managing director of the independent consultancy AutoForesight in Shanghai. State Grid is the main driver behind installing the charging stations and other infrastructure required to support electric vehicles. It has experimented with electric buses but lacks automotive technology. With a brand name, "If they want to build a higher-end EV, it would be easier to penetrate the European, American, even the Chinese market," said Zhang. Kai Johan Jiang, the alternative energy tycoon, was born in rural eastern China, went to school in Sweden and once worked for Volvo Trucks, according to his company's website. Most of his career has been in the energy sector. His company, National Bio-Energy Group, specializes in building and running power plants fueled by farm waste, such as straw and corn stalks. It has partnered in research on biomass energy with State Grid, whose logo is front-and-center on the Bio-Energy Group website. National Bio-Energy Group also has cooperated with Sweden in biomass research. Another of Jiang's companies, National Modern Energy Holdings, holds a 51 percent stake in National Electric Vehicle Sweden AB, the company set up to buy Saab's main assets. Sun Investment LLC, said to be a Japanese company, holds the remaining 49 percent. Saab's buyers say they plan to meld Swedish car design and manufacturing know-how with Japanese electric vehicle technology to promote premium electric vehicles in China - a goal that has so far proven elusive. Jiang and others did not disclose the price tag in announcing their purchase Wednesday of the Saab assets, which include the main parts of its auto manufacturing division. "Chinese customers demand a premium electric vehicle, which we will be able to offer by acquiring Saab," Jiang told reporters at a news conference at Saab's manufacturing plant in Trollhattan, Sweden. But buying a car factory will not guarantee success in actually making and selling premium electric vehicles, whether in China or elsewhere. China's economic planners have made development of electric vehicles a top economic priority, driven both by the need to reduce smog and also to curb soaring dependence on imported crude oil. But so far the market has failed to take off. Providing subsidies at the local level has only helped boost electric vehicle development in a couple of cities where local car manufacturers have relatively strong EV production, says Zhang. Jiang and his partners have tapped a former executive of Volvo Trucks, Karl-Erling Trogen, to head their consortium, which says it is already hiring staff to begin product development. Saab, which has more than 3,000 workers, filed for bankruptcy in December last year after its previous owner, the Dutch luxury car group Spyker - later named Swedish Automobile - failed to get sufficient backing for the brand. Helping perhaps to minimize friction over intellectual property concerns, the carmaker's Saab Parts unit was not included in the agreement. IP rights for the Saab 9-5 car model, owned by the brand's former owner General Motors Corp., were also excluded. Though Saab is not especially known for its prowess in electric vehicles, it will likely provide a platform for a prototype that State Grid could use to gain better cooperation with mainstream auto manufacturers, said Bill Russo, president of the consultancy Synergistics Ltd. Such companies have not been willing to take State Grid's lead in pushing ahead with new products. "You wouldn't buy Saab for its EVs. It's about the ability of a power systems company to commercialize EV technology," Russo said. "Will this lead to a high volume car business? Definitely not anytime soon," he said. SHANGHAI – After experiencing rapid development in the past decade, China’s auto industry now faces tough challenges: overcapacity, rising material costs and slumping sales. That’s the consensus among experts attending the ninth annual automotive industry forum held here by the China Europe International Business School. Annual production and sales growth in China likely will drop 5%-10% this year and next, with some estimates as low as 5%, from previous highs of 25%, says Dong Yang, vice president- China Association of Automobile Manufacturers. CAAM says industry sales reached RMB4.35 trillion ($684.4 billion) in 2010. But 2011 is proving to be difficult, with rising inflation and an appreciating yuan. Financing remains tight as Chinese banks are reluctant to lend, given the central bank has raised the 1-year deposit rate and lending rate by 25 points to 3.5% and 6.6%, respectively. China’s consumer price index, which has been running high this year, rose 6.1% year-on-year in September. The Chinese government predicted the CPI would climb 5.5% this year from 2010. What short-term succour exists for the Chinese auto makers comes with a green tinge: Local governments in six major cities – Changchun, Beijing, Shanghai, Hangzhou, Hefei and Shenzhen – now are offering subsidies up to RMB60,000 ($9,440) for consumers buying electric vehicles, sending a clear message that clean-energy cars should be the industry’s next big thing. First in line, Shenzhen-based BYD launched China’s first all-electric passenger car, the e6 in October. The car is priced at RMB369,800 ($58,179) before local subsidies. Foreign auto makers stress at the conference here plans to push into China’s EV market.Nissan Chief Operating Officer Toshiyuki Shiga notes his company’s electric Leaf, which is priced at about RMB208,356 ($32,780) in the U.S., recently received sales approval from the Chinese government. EVs will not be the only alternative-propulsion vehicles in China in the next decade, says Zhang Jinhua, vice secretary general of the Society of Automotive of Engineers of China. Others, including hydrogen fuel-cell cars and hybrid vehicles, will generate significant sales by 2020. 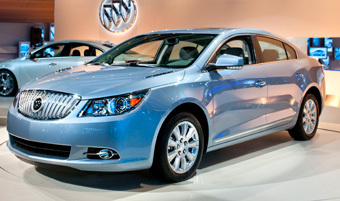 General Motors with joint-venture partner SAIC recently introduced a Buick LaCrosse with eAssist, which the auto maker says could lower average fuel consumption 20%. Priced at RMB265,000 ($41,692), it also is the first model targeting the Chinese middle class that sells for less than RMB300,000 ($47,198). GM-SAIC plans to add capacity to build 410,000 vehicles a year in order to produce 1.9 million units annually by 2015. FAW is adding capacity to produce 960,000 units annually by 2015, while Volvo-owner Geely plans to add capacity to manufacture 1 million vehicles, in order to reach 1.68 million units annually by 2015. Great Wall and Chang’an will add 1.3 million and 900,000 units of capacity, respectively, in the same timeframe. The risk here of course, especially given falling demand and rising material costs, is overcapacity, especially for those auto makers that fail to improve marketing and research-and- development skills. These are the key challenges facing Chinese auto makers in the coming years, says Bill Russo, Senior Advisor with the Booz & Company global-strategy firm’s automotive practice in Beijing. Russo, a former Chrysler China executive, tells WardsAuto the market’s future will be decided by which auto makers get sales-and-service networks in place in the emerging second-tier cities. This is where the bulk of new sales are expected to emerge as Beijing, Shanghai and Guangzhou restrict car sales to cut down on traffic congestion. Exports offer one way out for brands saddled with excess capacity, and certain OEMs, such as Great Wall, have been aggressively expanding overseas sales. But there are issues to overcome. Marketing abilities remain a particular challenge for local brands both in export and domestic sales. Developing reliable parts and service networks are other weaknesses. These issues partly could be addressed by foreign acquisitions, experts here say. Hangzhou-based Geely, for example, plans to sell 200,000 Volvos in China by 2015. And Tangshan-based Pang Da Automobile Trading and Jinhua-based auto maker Youngman are jointly paying €100 million ($138 million) to buy Sweden’s Saab. The deal is waiting for regulatory approval. But Dong, of CAAM, warns going abroad is risky and requires a lot of research and negotiations. “You have to show the foreign government what kind of benefits you are going to bring them and comply with local regulations,” he says. Auto makers in China believe increasing competitiveness will see profitability squeezed further, compelling them to expand their portfolios while also refreshing existing models. Hua Ming, who runs a Volkswagen dealership in Beijing’s business district, has seen a 20% drop in sales so far this year, which he blames on the city’s new limits on car ownership. To compensate, he has opened a dealership in Shijiazhuang, the capital of neighbouring Hebei province. Hua says Chinese auto makers have a chance to capture market share if they’re faster in expanding sales-and-service operations to lower-tier cities, where average per-capita income stands at half the Beijing urban average of RMB120,768 ($19,000). “But all brands have to understand rural preferences for more durability and less fancy electronics and features,” he says. Markets worldwide have been shaken recently by unexpected signs of slowdown in the Chinese economy. But one sector seems to be bucking the trend – and without much in the way of government stimulus. Car sales in China rose 22.6 per cent year on year in May, according to figures released by the China Association of Automobile Manufacturers. Association officials said they expected the market to strengthen further in coming months. General Motors’ total vehicle sales rose 21 per cent year on year in May; Nissan gained 20 per cent; and German carmakers BMWand Audi were up 31 per cent and 44 per cent respectively. The figures represent a recovery from the industry’s slow growth in the first quarter, with passenger car sales – excluding small commercial vehicles – for the first five months growing 5.5 per cent on the same period a year earlier. Those are hardly the kind of figures to give global stock markets the jitters, especially when compared with figures from India, where car sales rose only 2.8 per cent year on year in May. The Chinese sales figures came before last week’s interest rate and petrol price cuts, and were achieved with little in the way of government stimulus. However, Klaus Paur, auto analyst at Ipsos in Shanghai, does not expect a “significant direct impact” on car sales from either lower interest rates or fuel price cuts. Analysts are divided on whether the government will step in with further stimulus measures targeted at the auto sector. “I think China is not able to issue further stimulus policies this year,” says Rao Da, secretary-general of the China Passenger Car Association. Measures announced recently by central and local governments – such as Chongqing’s Rmb3,000 ($475) car purchasing subsidy – have so far had little impact, analysts say. News last month that Beijing would spend Rmb6bn to support alternative fuel vehicles has had little impact. “This is a very small share of the overall market today,” says Mr Russo. The Chongqing stimulus is designed primarily to help the local carmaker, Chang’An. “Other substantial markets with local production such as Beijing, Shanghai and Guangzhou are very unlikely to follow such a measure,” says Mr Paur, noting that those cities are imposing tough measures to restrict new car registrations. But the picture is not all rosy in the China car industry: “Carmakers appear to be disproportionately optimistic while inventories at dealerships are growing,” says Mr Paur, noting that this “could put pressure on car prices and profitability”.